Native Americans had a long and rich history in Southern California well before Spanish settlers could ever be described as “fresh off the boat,” but unfortunately due to disease, dispersement, and development (along with some Mission-style romanticizing of the past), many Californians aren’t aware of the extent of their presence or depth of their culture. Some estimates put upwards of 20,000 Chumash and Gabrieleno-Tongva Native Americans scattered throughout Southern California before conquistadors started naming everything they saw after Catholic saints. The two loose groups had extensive trade, with the Chumash generally occupying the coastal areas and the Gabrieleno-Tongva living a bit more inland. 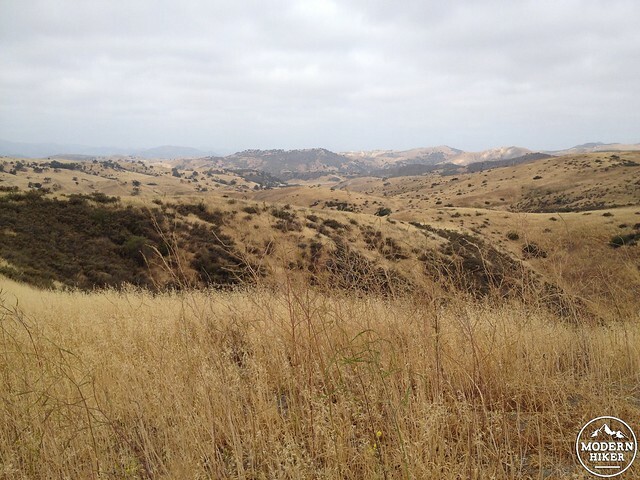 Sycamore Canyon in Point Mugu State Park was a major trade route between the coast and the San Fernando Valley, and those interested can visit an excellent interpretive history center just to its north at Satwiwa, the site of an old Chumash village. 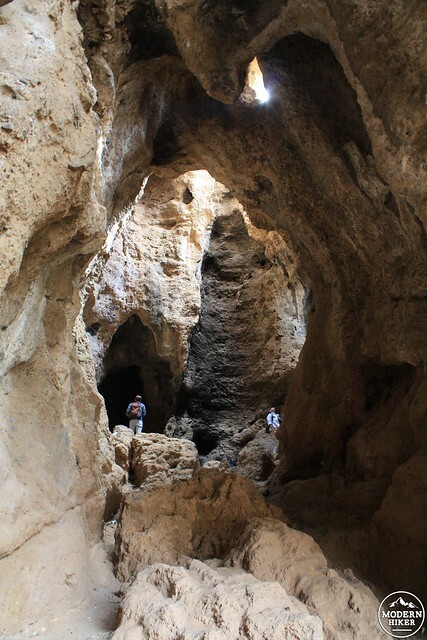 Just a bit to its northeast past the old Ahmanson Ranch lies another important Chumash site — the Cave of Munits. 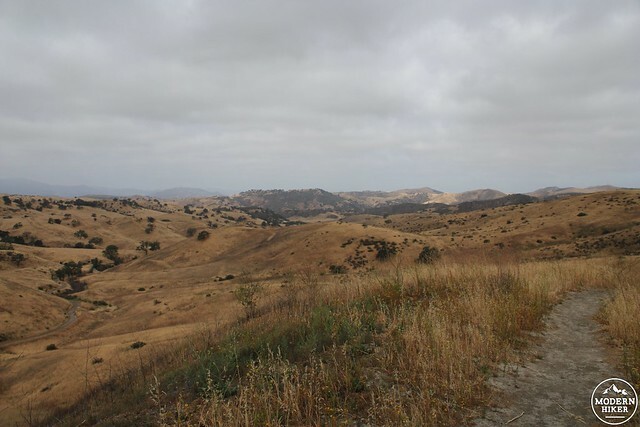 When the Ahmanson Ranch became a park in 2004, it protected the surprisingly spacious cave as well as 2,650 acres of beautiful rolling hills, prairies, and former ranch land. Nearby Castle Peak (a corruption of the Chumash name Kas’elew) was used as an important ceremonial site by the Chumash during the solstices, and the Cave of Munits – which lies in direct sight of the low, rocky peak, was reportedly the home of a powerful Chumash shaman who was killed after murdering the son of a powerful chief. 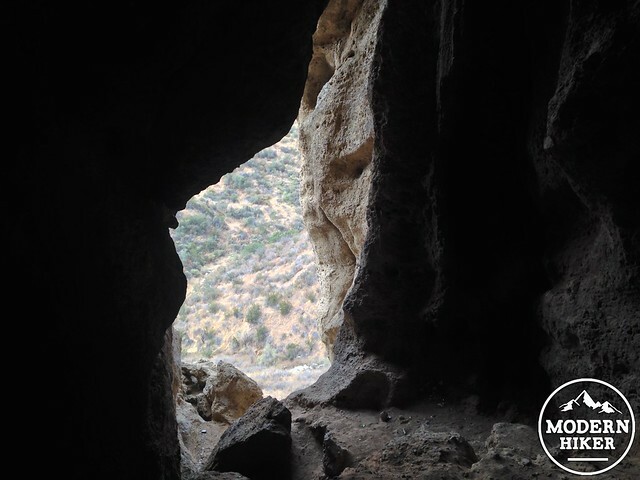 Today, the cave can be easily visited with a short hike from El Escorpión Park or this longer, more pleasant loop from the Victory Trailhead. From the trailhead, pass the information boards and look for a use trail that goes straight up the hill directly in front of you. This park in particular is full of use trails like this. Some are old ranch roads, some are unsigned official trails, others are just worn into the landscape by hikers, cyclists, or equestrians. As you explore the park, be sure to keep an eye on where you’re walking – some (but not all) of these use trails are off-limits because they cause too much erosion and the park stewards are working to rehabilitate the region. This one, however, is OK to hike. The incline here is pretty steep – especially for the very beginning of a trail. You’ll gain just under 160 feet in 0.15 miles, so don’t feel bad about having to stop to take a breather or two on the way up. 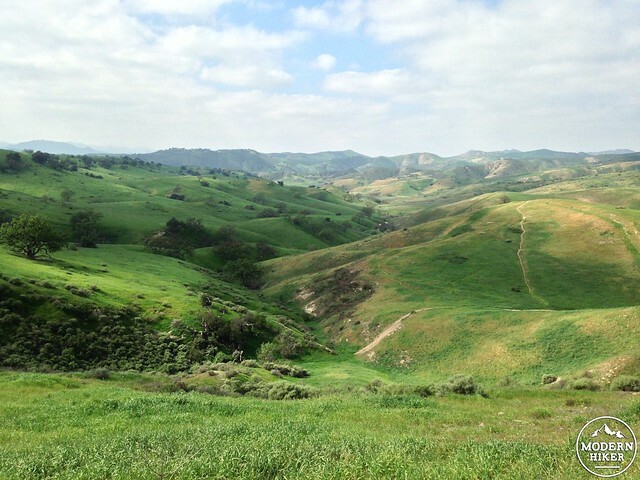 If you need an excuse, you can always just say you were soaking in some of the scenery of Upper Las Virgenes Canyon. In the late winter and spring, these hills are stunningly green. Most of the rest of the year the color is brown (or golden, depending on your opinion of dry, hot SoCal summers). At the 0.15 mile mark, the trail crests on a ridge and begins a slight decline. Just past 0.3 miles, stay straight at the junction with use trails to continue on this route. 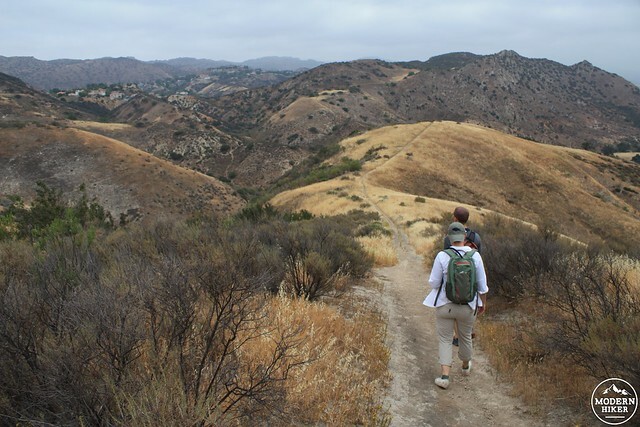 You’re hiking above and fairly parallel with the East Canyon Trail now, the major east-west route that connects the Upper Las Virgenes Canyon to Las Virgenes Canyon proper. Views to the west seem like they can go on forever here and you may want to spend a little time soaking them all in. If you’re a resident of the San Fernando Valley, seeing hills like these that aren’t covered in housing developments will likely bring a bit of joy to your heart. The trail meanders its way through a few small groves of sagebrush and purple sage. At 0.6 miles take a right onto one of the old ranch roads to start a short but very picturesque climb toward the north. Be aware that there is also a more narrow use/bike trail that branches off to the right in this area – if you head onto that one by mistake, you’ll hit some thick brush in a short distance. From here, you’ll be able to see some of the surrounding housing developments again. But you’ll also be able to spot the summit of Castle Peak and the Cave itself. Follow the road in this next photo, then look directly below the peak it’s “pointing” at to spot the Cave’s long vertical entrance. The lower peak to the right is Castle Peak. 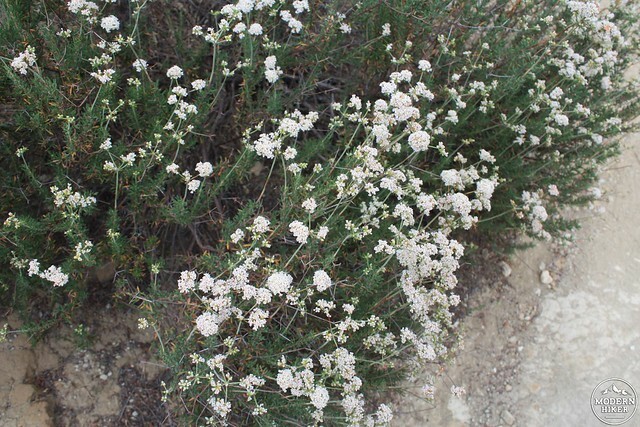 Follow this well-worn single track back down toward the valley floor, passing through tough-but-beautifully flowering California buckwheat along the way. The cave is very visible now, and you’re likely to be struck by just how large it is. Just wait until you scramble inside! At 1.4 miles, climb up a short scramble and take a left on the wide, well-established fire road (also known as the Hunter Allen Trail). 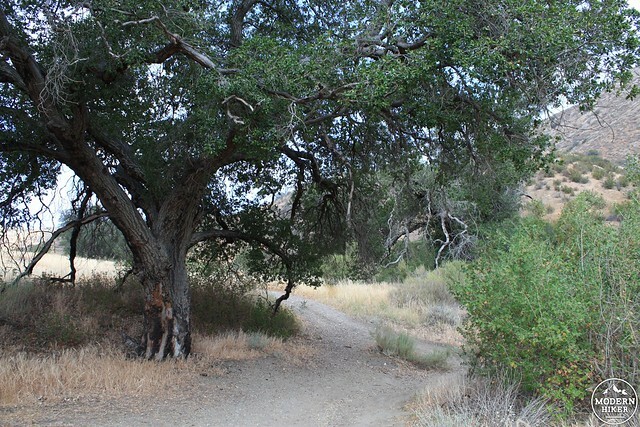 In another tenth of a mile, stay to the left at the three way junction near a mature Canyon Live Oak and head down a short trail toward another slightly more grizzled oak tree. From here, a clear use trail makes a bee-line right toward the entrance of the Cave. 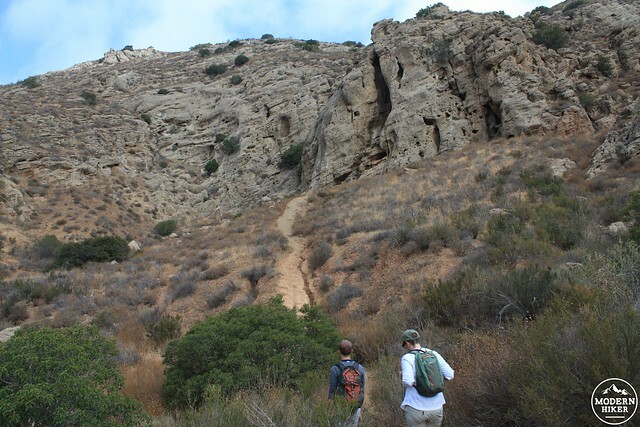 It’s easy to spot and relatively easy to hike, but it is steep and usually pretty sandy or dusty. Tread carefully to avoid slipping, especially on the downhill. The entrance to the cave looms in front of you, an epic and imposing vertical entrance on a wall full of pockmarked caves and weather-worn loops. At just before 1.7 miles and after a short, steep climb, you’ll be at the entrance to the Cave. If you have difficulties in enclosed spaces or aren’t used to rock climbing or scrambling you may want to just admire it from the entrance. If you want to climb inside, it’s a moderate scramble – but you will need to use your hands and feet (and maybe a few short leaps of faith) to make it inside. Once inside, you’ll be surprised at just how big the structure is. The walls of the interior fold and undulate into a seemingly endless series of side caves and back caverns. Although the cave itself doesn’t extend far past its entrance, its ceiling is very tall and it can feel like you’re standing inside a natural rock cathedral. 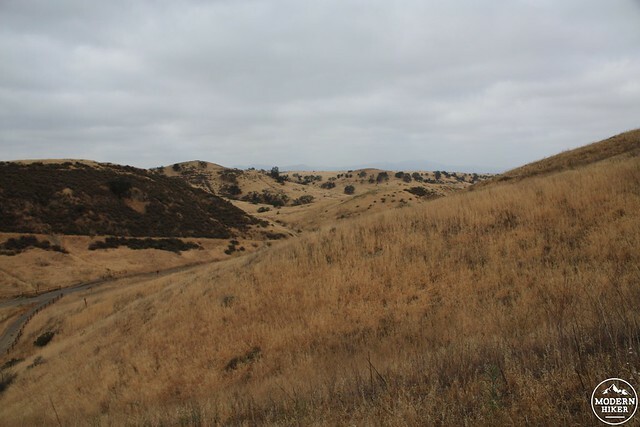 It’s not difficult to see why this area was spiritually important to the Chumash. As you might expect, the area is frequented by some people who don’t necessarily ascribe to the Leave No Trace wilderness ethic. As you’re scrambling up and walking around, be aware of broken glass on the cave floor. I will say, though, even with the litter, light graffiti, bird droppings, and leftover candles from more modern “spiritual gatherings,” standing inside this cavern is still an incredible experience. 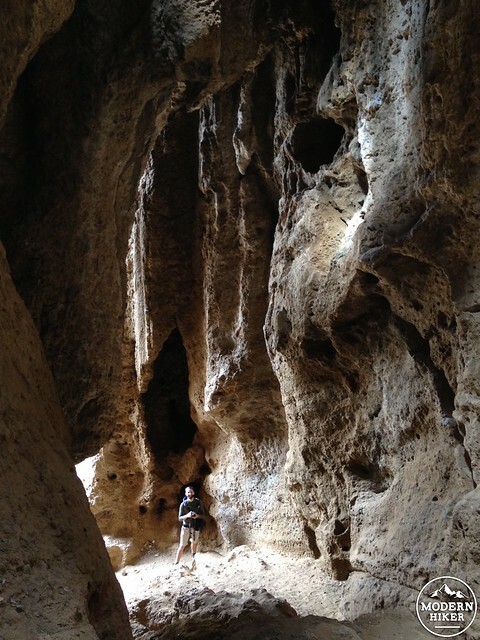 If you’re feeling especially adventurous, it is possible to climb up and out of one of the cave’s chimneys, scramble up the side of the mountain, and bushwhack a rough use trail along the ridgeline to Castle Peak. However, this route is only recommended for experienced scramblers and climbers. Once you’ve had your fill of the cave, carefully scramble back out to the use trail and return to the Hunter Allen Trail / fire road at 1.9 miles. Follow this fire road back to the trailhead. 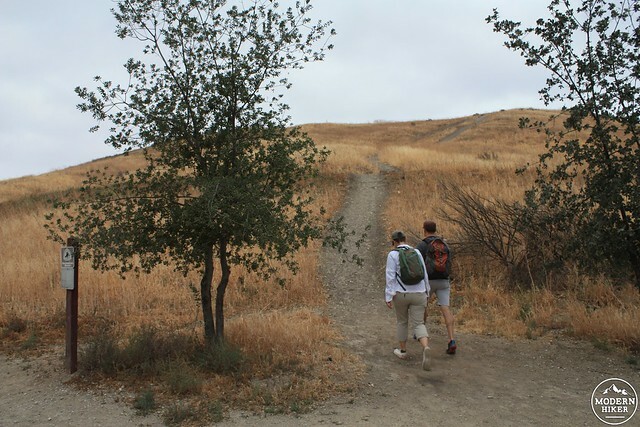 If you don’t feel like that was enough of a hike for you, consider adding on a loop around Lasky Mesa from the Victory Trailhead to create a nice figure 8 in the park. 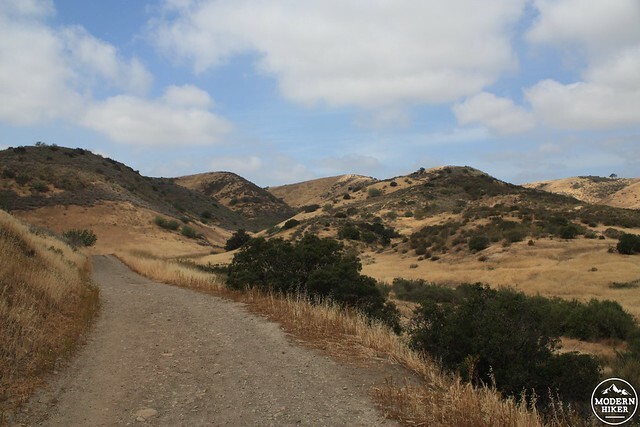 This route travels through the Upper Las Virgenes Canyon Open Space Preserve, which has a spiderweb network of official trails, use trails, and old ranch roads. While this loop route to the cave is all in good condition, most junctions are unsigned - so pay attention so you don't take a wrong turn. 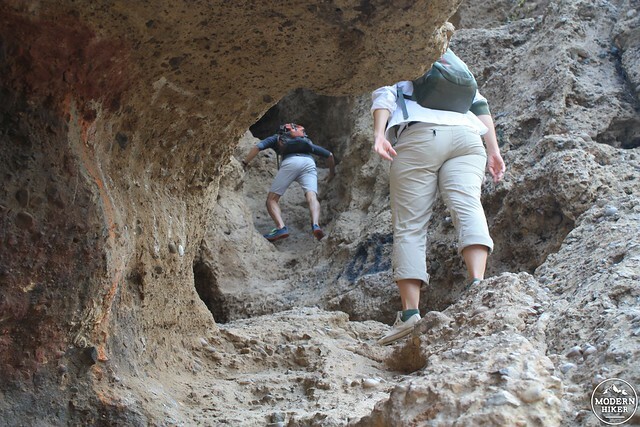 The trail into the cave itself is a sandy, slippery use trail followed by some moderate rock scrambling that will require the use of your hands and feet. From the 101, take the Valley Circle Boulevard exit and head north for 2.1 miles. Take a left onto Victory Boulevard. The Victory Trailhead will be at the end of the street. Parking is $3, or there is limited street parking available outside the trailhead. I loved this hike! I took the entrance from Vanowen in West Hills! I'm surprised that I didn't know this was in my backyard growing up as a child! I wouldn't recommend the climb to the cave to people with hip, knee, any joint, or back problems. Other than that, it wasn't too difficult of a hike! A few small inclines here and there. Thanks for the input, Jen! I just updated the write up to be a bit more clear and to warn people about that use-trail. Thanks for the write up! I also got tripped up at 0.6 miles but it was easy to see from that wrong turn where we needed to go. It was more of a left on the trail at that point. I also found the scramble into the cave to be a bit terrifying (the last third of it feels pretty vertical) and I chickened out before I got inside since one bad step could mean serious injury. But, if you are confident in your climbing abilities you should be fine! 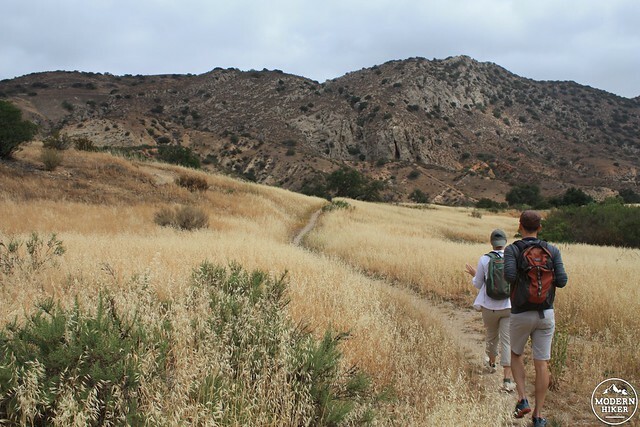 This is a great fun easy-to-get-to hike, glad you recommended it to us back in Spring when all the views of the surrounding rolling hills were so amazingly GREEN! I found getting in and out of the cave terrifying. But I am a wuss when it comes to solid rock. Next time I actually might bring rope. Scrambling to the top of Castle Peak was worth it though, fun to trek across the ridge and reconnoiter. This was a great hike, really stunning views. It's a little easy to get tripped up at the beginning, particularly where it say "At 0.6 miles take a right onto one of the old ranch roads to start a short but very picturesque climb toward the north." There is a skinny use trail that also heads north about 50 feet before the proper turn. I made that right by mistake, and it wasn't until I was in a giant sage thicket that I realized my error and backtracked. Otherwise, pretty straightforward. 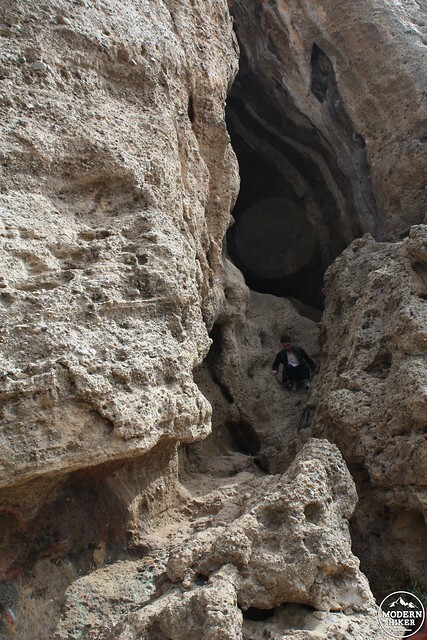 I'd also add that while climbing INTO the entrance of the cave wasn't that difficult, climbing back out felt fairly dangerous, at least for someone going alone. There were no decent footholds on the decent, and since it's so steep, one slip and you're toast. Just something to be mindful of.